As we are all becoming increasingly aware of our own carbon footprint, perhaps it’s time to think about how your home contributes towards this. 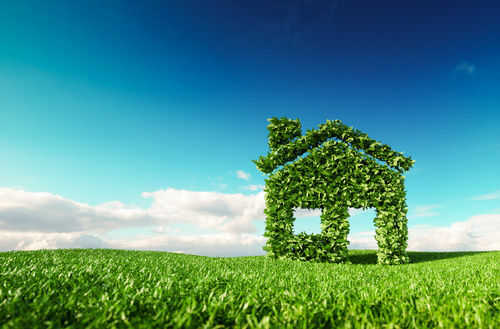 Upgrading to an eco-friendly home can help you reduce your carbon footprint, means lower fuel bills through energy efficiency, and creates a healthy living space. New build properties deliver on every level. Research that has recently been carried out by the Home Builders Federation shows that more than 8 out of 10 new build properties have the top A and B energy performance rating, compared with only 2.2% of existing housing stock. This means that owners of older properties will consume more energy to heat and light their home, which is not great for the environment or bank balance. New build homeowners spend an average of £443 a year on energy bills compared to £1072 for an owner of a typical older property. That is a whopping saving of £629 per year! According to the National House Building Council Federation and the Zero Carbon Hub this could make owning a new home 47-55% cheaper (depending on size) than another type of property on heating and energy costs alone. Add to this the fact that fuel costs have already increased by around 36% in the last 10 years and are most likely to increase each year, homeowners of new properties are likely to see that saving grow. The new home developers that we sell properties for are driving energy efficiency in their new build homes in Sussex through a combination of design and the use of modern materials and technology. For example, installing boilers that will only give you hot water when you need it, and energy efficient underfloor heating or gas central heating systems that can be zoned and controlled to ensure that you are only spending money to heat your home when and where you need it. These systems can also be controlled remotely via your smartphone letting you control the temperature even when you’re not at home. The majority of the new build properties also have solar panels to produce your own renewable energy to heat and light your home, which will certainly bring you energy bills down further. Double or triple glazed windows and doors filled with argon gas with airtight and watertight seals are a common feature too, as is high-tech insulation in roofs and walls to stop the heat from getting out and the installation of highly sophisticated water drainage systems to ensure your new home is water efficient too and therefore keeping your water meter from running out of control. In terms of lessening your carbon footprint, it is also worth noting that 30% of the UK’s energy consumption comes from housing, so new build homes are also delivering significant benefits to the environment too. Our new website allows you to search for our current new build properties in Sussex. If you’d like to be made aware of new developments in your area to buy off-plan, send your details to our Land and New Homes team at brighton@oakleyproperty.com or visit us in our New Homes Lounge which is now open in our Central Brighton branch.